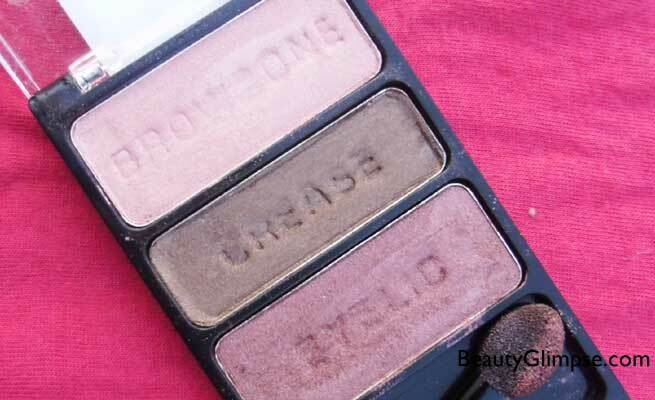 Wet n wild trio eye shadows are very popular in aboard and I’ve read many good reviews about them. I wanted to have at least one of them since long and I finally got one when my sister got it for me. The eye shadow trio is very cheap and I so wish that “wet n wild” launches in India soon, I don’t know why affordable and amazing brands don’t come to India. Moreover, this brand is also not available online easily. Anyway, let’s move to the review girls. Price: $2.99 for 0.12 oz. The eye shadow trio from wet n wild comes in a plastic packaging and it has a transparent lid. The shades are visible from the lid and you can identify the palette easily if you have many of these. The trio comes with three coordinating shades and eyelid, crease, brow bone are imprinted on it which is good especially if you’re a beginner. The trio also comes along two brushes, one is a sponge eye brush and the other is a blunt cut brush. The brushes are very small and it’s very difficult to use them. The brow bone shade is a pale shade which gives a matte finish after application. I will not count it as a brow bone shade because it is slight pink and I prefer a white highlighting shade for my brow bone area. But I apply this shade all over my eye lid for daily use when I need a subtle look as it looks natural. This shade is not very pigmented and you need to swipe it 4-5 times to get pink shade. The crease shade is a light warm brown satin which is decently pigmented and you can build it. This shade has fine shimmers in it but they are not glittery and don’t look over-the-top. This is a very beautiful crease shade. The eye lid shade is a deep burgundy shade and it’s my favorite shade amongst the three. It is the highly pigmented shade and one swipe is enough to get intense color. It doesn’t have shimmers and it gives a matte finish. The texture of the palette is smooth and the eye shadow glides easily without tugging. 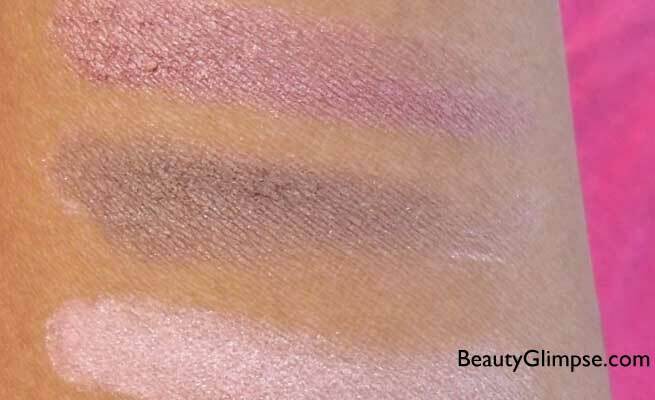 Blending the shades is also very easy due to the soft texture. All the shades are well pigmented except the brow bone shade but you can build it accordingly. Eye shadow shades stay for around 4 hours without a base beneath and I’m surprised by the staying power. At this price, I was not expecting a good staying power but this palette has amazed me. The quality, the texture, the pigmentation and the staying power… everything is amazing about this eye shadow. I don’t think I have anything to complain about except the availability in India. Recommendation: This wet n wild Eye shadow trio is a great value for money deal as the quality is really good and the price is affordable. The palette has three shades which are decently pigmented and you can build the color accordingly, the shades stay for long without creasing. I would highly recommend it to all those looking for an affordable eye shadow quad.